DETROIT (WWJ) - The Detroit Symphony Orchestra (DSO) has partnered with the Sphinx Organization to host the annual Sphinx Competition at the Max M. Fisher Music Center, home of historic Orchestra Hall. The 16th annual Sphinx Competition is scheduled for February 13-17, 2013. The Sphinx Competition is open to all junior high, high school and college-aged black and latino string players residing in the U.S. The competition offers young black and latino classical string players a chance to compete under the guidance of an internationally renowned panel of judges and to perform with established professional musicians in a competition setting. 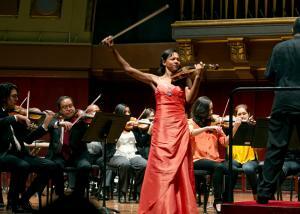 Its primary goals are to encourage, develop and recognize classical music talent in the black and latino communities. “Sphinx treasures its partnership with the DSO under the leadership of Anne Parsons and Leonard Slatkin. We salute the orchestra’s own long-term commitment to diversity,” Aaron Dworkin, Founder and President of Sphinx, said in a release. The DSO has hosted the Sphinx Finals Concert of the competition since 2001. This year, Sphinx semi-finals, as well as the honors concert will also take place at the Max. M. Fisher Music Center. For more information, visit www.dso.org or www.SphinxMusic.org.